This page of our website will evolve over time. We are happy to take requests from parents about what it is that they would like to see in this section and will endeavour to provide an informative list of information. The information in this section has been listed alphabetically. See our OHSC section on the main menu for all the information on after school care. Assembly is held every Friday afternoon commencing at 2.45pm and concluding at the end of the school day at 3.30pm. At assembly we talk about what’s been happening around the school, recognise achievements, hand out awards, and sing the national anthem accompanied by our teachers on guitar. One of our fabulous musical groups or choirs might perform. Parents are most welcome to attend. To provided a sense of community and support for our Foundation (Prep) students we have a very successful Buddies Program. Year 6 children are buddied up with a new Foundation student . They work together throughout the year on various tasks developing a wonderful bond where the Senior student gains skills and has a sense of responsibility for assisting their Foundation Buddy. The Foundation student gains valuable support, both academic and social which allows them to quickly feel confident at school in their first year. A school life friendship is created . The Camps, Sports and Excursions Fund (CSEF) helps ensure that no student will miss out on the opportunity to join their classmates for important, educational and fun activities. CSEF will be provided by the Victorian Government to assist eligible families to cover the costs of school trips, camps and sporting activities. Families holding a valid means-tested concession card or temporary foster parents are eligible to apply. $125 per year will be paid for eligible primary school students, with $225 per year paid for eligible secondary school students. Payments will go directly to the school and be allocated to the student. At Donvale primary we encourage parents to be involved at school. A Parents as Helpers Course is conducted at the beginning of each school year. Parents wanted to become helpers are required to attend this course. A Working with Childrens Check is required. The role of the parent helper varies depending on the year level. Please contact your child’s teacher to see how you can become involved. The Donvale community believes that in order to grow educationally, socially and emotionally, children need to be in an environment, which is supportive, consistent and where appropriate limits have been set. We expect that students, parents and teachers will treat others as they expect to be treated themselves. Please read the attached Behaviour Code of Conduct document with your child. Please support the school by supporting and abiding by the code. We are so lucky to have a dedicated drop off zone for our children. Please use it wisely and see the attached document for the safety rules. This is important, as it has been developed to protect our children’s safety. Environment policies/recycling, water tanks etc. At Donvale Primary we are very environmentally conscious, and have a number of initiatives in place to support this. We have made a commitment to become a more sustainable school. We identified the need to educate children about being conscious of waste and assist them to identify sustainable practices for school and home. Sustainability units have been developed across the school, with a different focus at every level. Each grade has a daily ‘fruit time’, where they take a break and have some fruit brought from home. This provides a great mini break as well as a very real opportunity to encourage the advantageous act of eating healthy fruit. Please see the Year Level Information page and look in the general information document for homework information that relates to your child’s level. We are lucky to have a new, light filled, spacious library, which is a wonderful place for children to develop the love of literature. Children are able to borrow books each week. Library bags are required to transport the books and keep them in great condition. It is up to your child to remember to return books in order to re-borrow. Reminder notices will be sent if books are very late. Items of lost property are placed in our lost property box located in the main building corridor opposite the door to our library. 1/ The first place to look for lost property items are the baskets that are located outside the main doors at the ends of each building. 2/ Check on the shelves in your building . 3/ Look in the lost property cupboard in the main building. Its vital that all clothing items are clearly labeled with your child’s name, and class so if handed in at the office it can be returned. 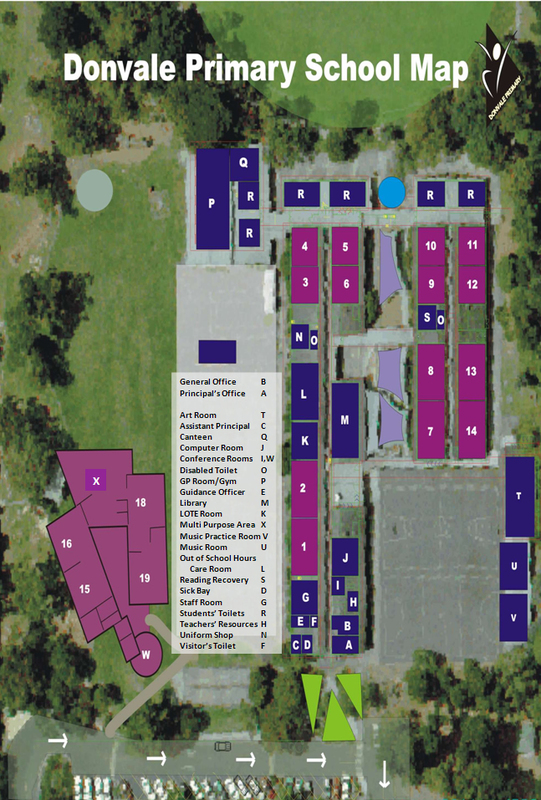 This map of the school shows a building plan, helping you or your children find your way around. In the event of the need to administer medication to your child this is the responsibility of our School administration staff. If medication is to be taken at school, parents must fill in a Medical Permission Form, which is available from the school office or downloadable here: Medication v0 1. All medications are to be handed to the office on the day in a small unbreakable container, clearly marked with the child’s name, room number, and dosage details. Teachers cannot be responsible for reminding students. The office will record the time when the medication is taken. If your child suffers from allergies or is anaphylactic, an allergy management plan must be completed. We are an accredited Anaphylactic Treatment School. All staff are trained in the treatment of Anaphylaxis and Asthma conditions on an annual basis. Privates music lessons are available on various instruments. Our School Office is a very welcoming, friendly area, providing information and administration to our school. The Hours are 8:45am -4:30pm each school day. Mrs Sndy Bryant is the School Business Manger and Mrs Wendy Cheesman is our Administration officer. Both ladies will assist in any way to explain or answer your queries. They provide high quality information, about a myriad of school issues, in a friendly, yet professional manner.You can phone the office on 9842 3373 or fax us on 9841 7033. If we are not in the office, there is an answering machine on the phone after hours. Donvale Primary School’s Parents’ Association is run by an elected committee of parents with the help and support from the general parent population. We plan and implement a variety of fundraising activities and special events throughout the year to help raise funds for and on behalf of our school. All parents are encouraged and most welcome to attend our monthly meetings. Further information can be found on our P.A. Page and weekly updates can be found in our News section. See Drop Off Zone and Road Safety Rules. The school has a strong anti bullying program and student self esteem is valued and developed. We have trained Senior students in Peer Mediation. This program supports students in solving playground problems. We have very extensive, well maintained playground areas, which encourage active play as well as providing a wonderful area to socially interact in small friendship groups. There are many places to play, intermingled with spots to sit and chat, passive areas for reading or just chilling out. We are also very fortunate to have two large ovals , two gazebos , a covered sand pit, an extensive adventure playground area , playground equipment under shade sails as well as two brand new challenging playground complexes. We are blessed with a very large, expansive playground area which allows all students the opportunity to play in an unhindered relaxed and safe manner. At all times we have three staff on duty in the play areas . These staff also have responsibility for supervising the main oval and the toilet areas. A system of first-aid passes operate for any students who require mecical assistance during Recess and Lunchtime. At all times we have fully trained staff available on first Aide roster to provided medical assistance at all times. We have 16 staff fully trained in Level 2 first aid. At the end of each year our Year 5 & 6 students nominate and then elect our School Captains and Vice Captains from their peer group for the following year. The successful students are presented to our school at Grade 6 Graduation and then invested at a full school assembly early in February. The School Council is the legal body of six nominated and elected parents, five elected representatives of the Department of Education, four co-opted members and the Principal. The School Council is appointed in accordance with Government policies and guidelines. The School Council is responsible for the management of the school, including finances, buildings, grounds, and equipment. Much of the work is organised through sub-committees. The School Council reports to parents through a formal written annual report, as well as regular articles in the newsletter. School Council elections are held each year, in Term 1. Remember, the parents on School Council are your representatives. Any parent wishing to become involved with any of the School Council activities please contact the school or any School Council member. Please see the School Council Page for further information. We have an active Parents’ Association and a great community spirit at Donvale Primary. There are often special events and morning teas etc. organised for the parents to attend. Details of these are provided each week in Snippets, our school newsletter. Donvale Primary adhere strictly to a sun smart policy. Hats are compulsory in Terms 1 and 4. Sunscreen is to be applied at home by a parent. Children may apply their own sunscreen at school if they are capable (which we encourage). If your child attends school without a hat, they will be required to stay either inside or in complete shade during recess and lunch. All students participate in an annual 6-day intensive swimming program, which is run by Aqualink in Box Hill. This is generally held in December. Donvale Primary School has a compulsory uniform policy. Please see the Uniform page for further information. Working bees are run throughout the year to keep our school looking great. They are a great way to meet other parents and help out. The parents association generally put on a free sausage sizzle for the workers.